Submissions have opened for the 2018 William Hill Sports Book of the Year award, which celebrates its 30th birthday this year. The award, worth £30,000 to the winner, is open to books published in the UK for the first time during the period 13 October 2017 and 12 October 2018. Further details here. The judging panel, chaired by Graham Sharpe of William Hill, is Clarke Carlisle, John Inverdale, Danny Kelly, Mark Lawson, Hugh McIlvanney and Alyson Rudd. The longlist will be announced on 20 September, the shortlist will be announced on 23 October, and the winner will be announced on 27 November. 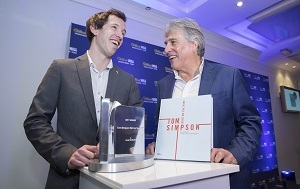 Photo: Andy McGrath (left) receiving the 2017 award from John Inverdale for Tom Simpson: Bird on the Wire (Rapha Editions).